Top leaders of Vietnam and Finland have agreed to raise two-way trade and Finnish investments in the Southeast Asian country to 1 billion USD respectively within the next few years. Vietnamese State President Nguyen Minh Triet and his Finnish counterpart Tarja Halonen reached consensus on the issue during their talks in Helsinki on May 20, following a ceremony held to welcome the Vietnamese leader. In the spirit of trust and openness, the two heads of state informed each other of the situation in their respective countries, and agreed that the bilateral ties are developing fruitfully. They discussed a range of directions and specific measures to step up multi-faceted cooperation in the years to come, focusing on the fields of politics-diplomacy, development cooperation, economics-trade-investment, labor, education-training and response to clime change. 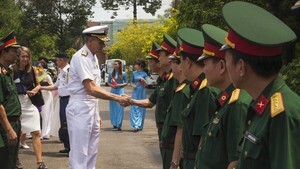 President Triet said he was delighted to pay his first-ever State-level visit to Finland and thanked the Finnish government and people for their valuable support and assistance extended to Vietnam during its past struggles for national independence and reunification, as well as in the current process of national construction and international integration. President Halonen expressed her wish that the two nations will continue to mutually back and assist each other and pledged Finland ’s support for Vietnam ’s renewal process. Finland will provide more official development assistance (ODA) to Vietnam , with priority given to green technology, safe water, afforestation, clean energy, response to clime change, scientific research and vocational training. The two presidents agreed to continue building a cooperative partnership for development of both countries on the basis of stability, durability, equality and mutual benefit. Regarding politics, they agreed to increase the exchange of high-level visits to enhance mutual trust and understanding between the two nations’ leaders, thus laying the foundation for expanding cooperative relations in other areas. The two sides decided to set up a deputy foreign ministerial-level bilateral political consultation mechanism. On economics, the two leaders held that despite recent progress, trade and investment ties have yet to match with potentials and desires of both sides. They pledged to create favorable conditions for Vietnamese and Finnish businesses to meet and invest in each other’s markets. President Triet affirmed that Vietnam will continue to speed up its economic reforms and fully perform its commitments to the World Trade Organization (WTO). Vietnam will provide the best conditions for Finnish companies to make long-term and effective investment in the country, especially in fields where they boast strengths such as information technology, ship building, wood and paper industries, and environmentally friendly technology, he said. President Triet told his host that Vietnam is also willing to serve as a bridge for Finnish firms to enter markets of member countries of the Association of Southeast Asian Nations (ASEAN). He also proposed that Finland facilitate the penetration of Vietnamese goods in the Finnish market as well as the North European and the European Union (EU) markets. The two heads of state noted potential for bilateral labor cooperation. They applauded the effective implementation of a pilot program on migrant workers and agreed to entrust concerned agencies of the two countries to study and expand this cooperation program. While emphasizing the importance of cooperation in education and training, the two leaders agreed to promote bilateral cooperative relations in this area. President Halonen said Finland will create better conditions for Vietnamese students to study in the European country, and will foster joint training and scientific research between universities and institutes of the two nations. The two presidents exchanged views on regional and international issues of mutual concern, and promised to boost cooperation and reciprocal support at regional and world forums and organizations. President Triet confirmed support for Finland’s efforts to beef up relations with ASEAN, particularly when Vietnam is undertaking the bloc’s rotating chairmanship in 2010. President Halonen spoke highly of Vietnam’s role and position in the region and the international arena as well. She expressed her belief that Vietnam will successfully take over the ASEAN chairmanship this year and affirmed support for Vietnam ’s bids to strengthen comprehensive cooperation with the EU. On this occasion, the two nations signed a revised agreement increasing the Finnish funds for phase II of Program 135, which is designed to bolster socio-economic development in disadvantaged and mountainous communes, and a cooperation deal between the Vietnam Chamber of Commerce and Industry and the Finnish Chamber of Commerce. The same day, Helsinki City Council Chairman Otto Lehtipuu presented the city’s honorable order to President Triet. Later in the day, President Triet held a meeting with Deputy Speaker of the Finnish Parliament Tarja Filatov, during which he requested the parliament to back Finland ’s continued provision of ODA to Vietnam and expansion of the pilot program on migrant workers. The State leader expressed delight at positive developments in cooperative relations between the two countries’ legislative bodies, citing the Vietnam visit by Speaker of the Finnish Parliament Sauli Niinisto in January 2010 and the trip to Finland by Vice Chairman of the Vietnamese National Assembly Nguyen Duc Kien in last month. The exchange of visits created opportunities for the two legislative bodies to share operation experiences, helping to boost extensively and intensively cooperative relationships between the two countries, he stressed. Deputy Speaker Filatov praised great achievements the Vietnamese people have reaped during the renewal process. She said legislative cooperation is one of the most important factors to promote the relationship between the two countries, and that the Finnish Parliament will contribute further to strengthening the Finland-Vietnam friendship.